If someone made me choose a life without Brunch or a life without Happy Hour, I would absolutely lose my mind. First of all, I don't like this imaginary person AT ALL. Second of all, we're talking apples and oranges here. One takes place on a lazy weekend day, where you partake in completely acceptable daydrinking while stuffing your (occasionally hungover, I swear I'm not speaking from experience or anything, okay a little bit I am, help me) face with all of the brunch things. The other takes place after work, during the week, when a stiff drink, a trendy meal, and catching up with a good friend are just what the doctor ordered! It's a toss up. I wouldn't know what to do. My fake problems are the pits. But let me say - and please don't hate me for this - I do think Houston does Happy Hour better than Brunch. I have fallen in total love with my home city during the past two years (TWO YEARS?!) of living back here. And I have had some acceptable, and even some great brunches (RIP Sorrel). But from what I've found, there aren't a whole lot that live up to my post-NYC standard. But the Happy Hours? Houston's Happy Hour game is strong. I've managed to eat and drink at some of the nicest joints around town for dirt cheap, with the quality of service and food never lacking. I am a complete fan. So I was pumped to try out Downtown's MKT Bar (located in Phoenicia) for the first time with my friend Boh, whom I hadn't seen in a while. I love Phoenicia, if only to window shop and feel incredibly fancy in a grocery store (I mean, how could you not? ), so I had good feelings about the place. To start, Boh and I shared the hummus. I liked it, but it definitely was not my favorite hummus I've ever experienced. The hummus itself had a much thicker consistency than I'm used to, and the oven baked pita chips were a little overpowering in crispiness and flavor. I would have preferred a more subtle vessel for the hummus. 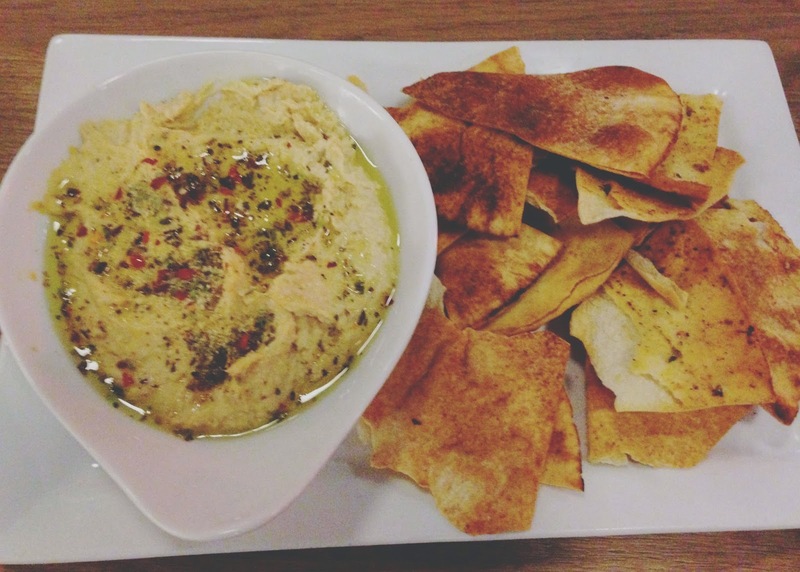 Again, I did like the hummus, but I would have liked to see an overall lighter dish that one typically receives when ordering hummus. Next up, we ordered the salt roasted beets with fresh tarragon. 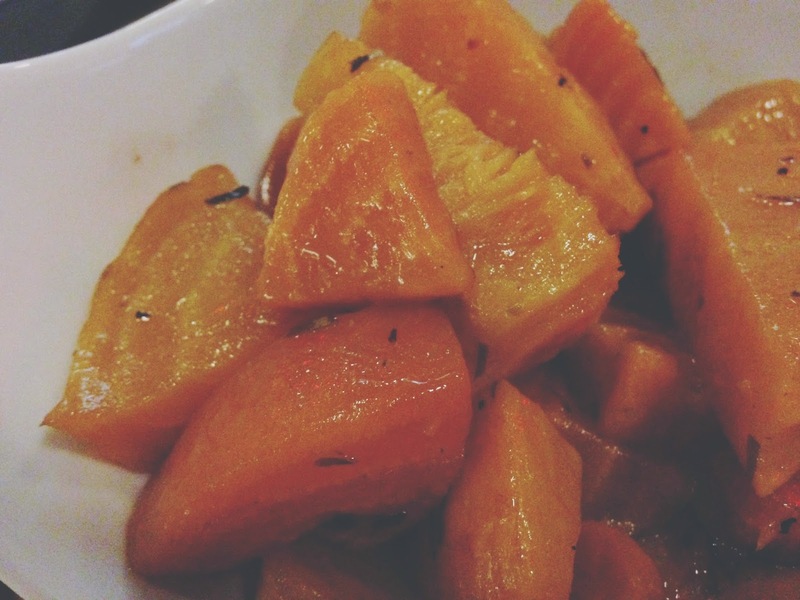 Much to our surprise we received golden beets, and the dish was soft, sweet, and comforting. This dish offered the lightness I was craving with the hummus, and yet at the same time it was filling and satisfying. The beets were roasted until very tender, and the tarragon spice was fragrant and balanced nicely with the sweetness of the beets. Our last dish we ordered (my favorite of the three) was the squashed pizza. 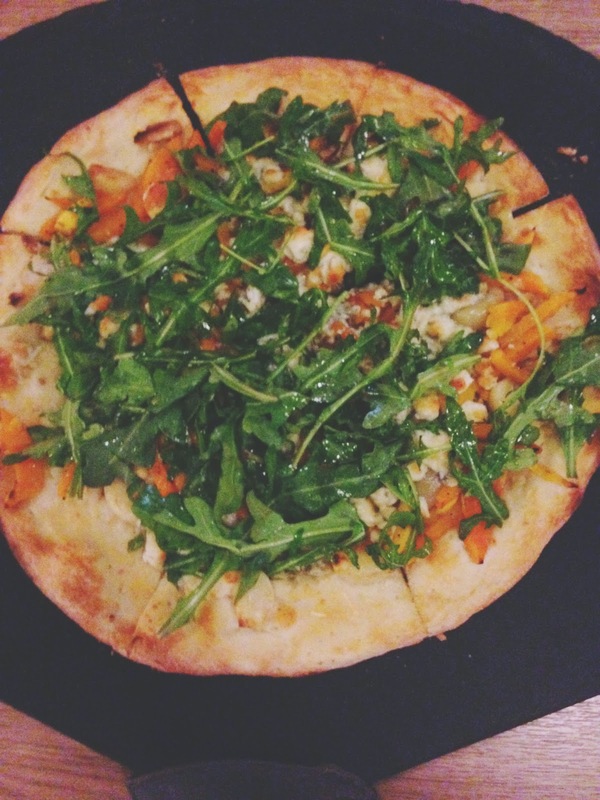 Topped with roasted butternut squash, roasted garlic, blue cheese, walnuts, and fresh arugula, the presentation was vibrant and colorful. The flavor combination of the sweet squash and earthy blue cheese, combined with the crunchiness of the walnuts was lovely. We ate the whole darn thing. I do think the addition of something a little sweeter than the squash - perhaps pear or apple - would have given the dish even more depth. All in all though, I would probably order it again. My portion of the bill came out to $16, which included half of the food a glass of wine. Was I blown away by the food? No, but I certainly did enjoy it. And the atmosphere at MKT Bar is just so cool. 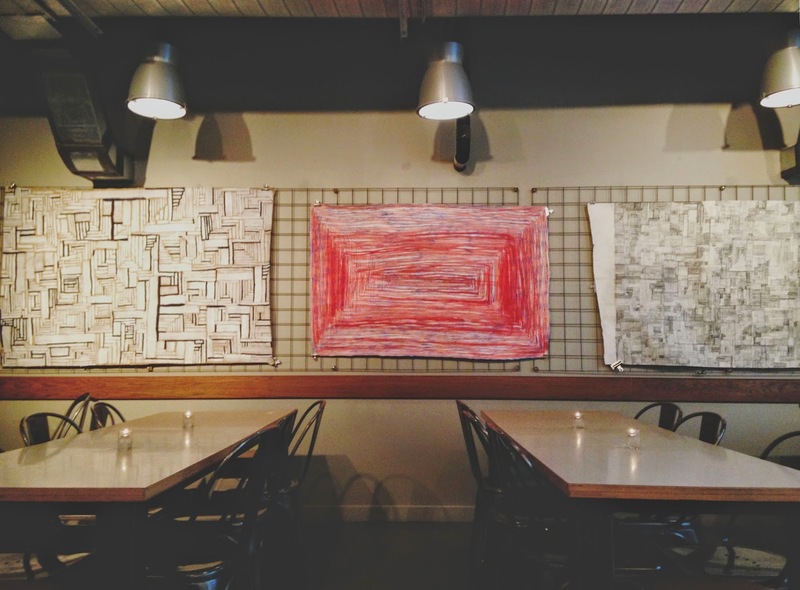 Exposed brick walls, industrial ceilings, buzzing energy, lively patrons, excellent service, and on that particular night a live DJ made it a great spot to indulge in a post-work drink and a few noshes with a good friend! I'm spoiled in that I work walking distance from Phoenicia and find its offerings amazing for lunch! That said, while I totally agree that their HH prices are great, it's always too damn loud for me in there (or maybe I'm just getting too old?)! If I want to catch up with a friend, it's proven to be less than ideal on most occasions, but at my visits, there has always been live music. Maybe the DJ is more conducive to talking over? 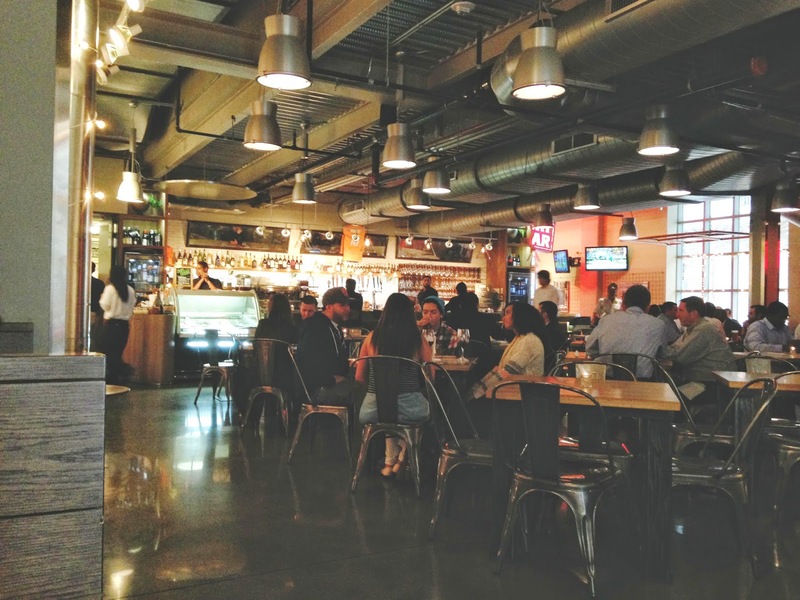 Also, for brunch, have you tried Seco's in West U or the always amazing Hugo's brunch? Both buffets, both fantastic for what they are (hole in the wall vs abundance in a trendier setting) and are at the top of my list! You ARE spoiled! We had a pretty early happy hour, around 5:30, so we may have been there before it got too noisy. Thanks for the brunch tips! I haven't tried either yet, but now they're on my radar! (Well, Hugo's has definitely been on my radar for a while that's for sure).